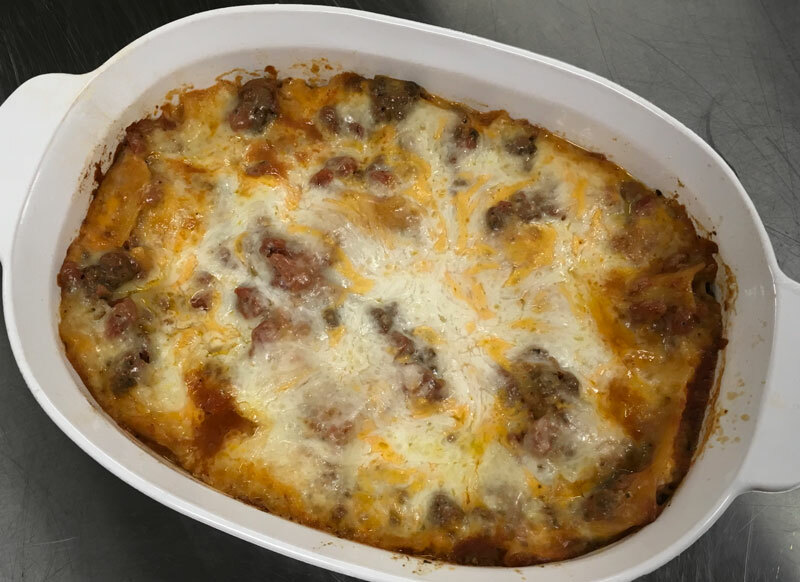 Lasagna Noodles - not precooked! Fry ground beef with 2-3 Tbls. olive oil. Add in the onion while cooking the beef. As the beef is done, stir in the remaining seasonings, and then the tomatos. Simmer for 2-5 min. while preparing the cottage cheese mixture. Use a deep 9” x 13” cassarole dish, or one with a lid so that the foil doesn’t stick to the cheese. Spray dish with non-stick spray for easier clean up. Start with a thin layer of your simmered meat sauce and add in 1/4 cup of water. Next add a layer of uncooked lasagna noodles. Add another layer of meat sauce. Next spread a portion of your cottage cheese mixture over the meat sauce. Repeat the noodle, meat sauce and cottage cheese layers until your dish is filled to slightly below the lip. Overflowing lasagna is not fun to clean out of the oven! If you like olives in your lasagna - you can add them in the meat sauce, or on top before the cheese. Top with a thicker layer of shredded cheese. Layer your lasagna - additional water on the bottom layer only! Pinch the edges of the foil covering to provide a tight seal. Cover WELL with foil or glass lid. If using foil, I suggested running your fingers all the way along the edge of your dish several times “crimping” the edges so that you “seal in” the moisture. Sometimes I substitute a layer of spinach and basil in place of one noodle layer - Yummy! If you wish to put this in the freezer - do so after cooking it, and keep in mind that the result is a dense dish, so it needs to come out of the oven in time to thaw before being re-warmed as a whole in the oven or “by the serving” in the microwave.